Some will simply make you laugh, while others’ voices will leave your jaw dropping. From America and Britain to the Arab World, Israel and Thailand, Got Talent has a universal appeal. The eighth season of “America’s Got Talent” featured four judges, former Spice Girl Mel B. and supermodel Heidi Klum, alongside veteran judges Howie Mandel and Howard Stern. Hosted by comedian Nick Cannon, the show features kids from across the nation performing onstage for the $1 million prize, along with fame and glory. Spectators get to feast eyes and ears on an assortment of acts, including singing, dancing, joke telling and magic. Some acts are rather impressive, while others lack enough talent to be seen on primetime. Regardless, each is entertaining in its own way to Dads and Moms who encourage their children’s ambitions to perform for large audiences. On top of their cool million, past winners of “America’s Got Talent” have gone on to some pretty impressive careers. Season five’s winner, soul singer Michael Grimm, toured with the Stevie Nicks and Heart. Meanwhile, the same season’s 10-year-old Jackie Evancho has released a number of top-selling albums. The second season’s victor, Terry Fator from Texas got himself a full-time gig at as a comedic ventriloquist at the Mirage in Las Vegas. 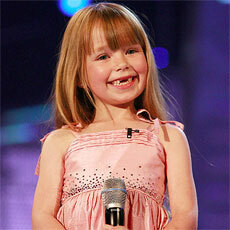 In fact, the premiere season was won by 11-year-old Singer and songwriter Bianca Ryan. Alluring to everyone from teens to boomers, the first season of “America’s Got Talent” was extremely successful. It opened the door for the Got Talent franchise with spinoffs in more than 50 nations. What makes the show so special is real kids displaying natural talent. It’s difficult to imagine any of them making it on television to chase their dreams without their parents’ encouragement and support. Reinforcing children’s major goals can be tough. It can be expensive to register your little girl in an after school dance program and more than a little irritating to stand behind a little boy who wants to play bang on the drums like a rock star all day. Yet, it is unlikely any of these kids’ biggest dreams could have any chance of coming true without parents allowing them to reach high. Of course, little ones (and big ones too) will sometimes face setbacks and disappointments. Not every girl can be a fast swimmer or every boy a champion wrestler. Accepting breakdowns and encouraging new approaches can make those moments some of life’s most valuable learning experience. NBC is currently holding auditions for Season 9 of “America’s Got Talent,” which will air this summer. You can learn more about the auditions here. A live production of the show is currently touring the United States. See how you can be entertained by fresh new talent without leaving your hometown. Here’s one of the funniest acts from last season’s “America’s Got Talent”. From across the world, “Israel’s Got Talent” showcases the amazing voice of a 13-year-old. This little boy’s voice from “Thailand’s Got Talent” will remind you of Whitney Houston.